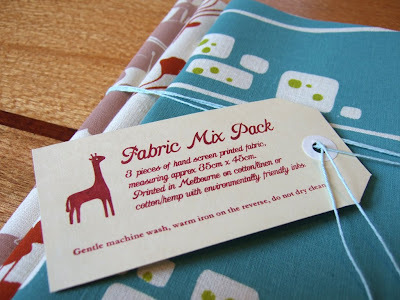 I finally got around to making some more fabric mix packs this week. For awhile now I've been unhappy with the presentation of the packs - it seemed a bit stale, not cute enough. 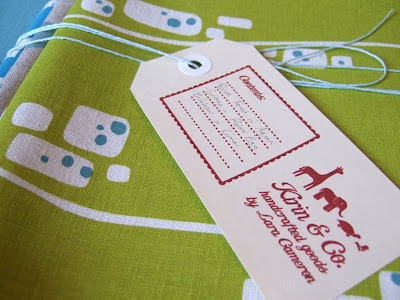 I like the idea of putting the fabrics in a cute little bundle, but you have to be careful doing that because if the thickness exceeds 2cm it becomes a 'parcel' rather than a 'letter' and therefore a gazillion times more expensive. Anyway, I think I've found a good middle ground. And with the addition of some old fashioned swingtags (gocco printed at midnight last night), I think they look much better all round. Gocco tip - I've often had problems with the large solid areas of my prints being a bit patchy. I believe this is due to excess carbon in the original artwork which overheats and stick to the screen. However - there's some special stuff you can get called "Artwork Clean-up Paper". It looks suspiciously like baking paper and you iron it over your original and it lifts the excess carbon off. Worked for me! Thanks for the gocco tip Lara - that's much appreciated. Have you got an Australia Post letter guage at home? It makes it a lot easier to stuff those parcels to the max before they exceed the 2cm rule. I always run my parcels through the guage as I love to get away with posting garments as letters. I use plain computer paper for my artwork clean-up, it works really good. i too much love these all!